Dems, White House Strike Deal On Auto Bailout Congressional Democrats say they have agreed with the White House on a plan to bailout the auto industry with $15 billion in emergency loans. The House could vote on it later Wednesday. The measure faces fierce Republican opposition in the Senate. Congressional Democrats say they have agreed with the White House on a plan to bailout the auto industry with $15 billion in emergency loans. The House could vote on it later Wednesday. The measure faces fierce Republican opposition in the Senate. And I'm Robert Siegel. The nation's struggling auto makers are a step closer to getting a lifeline from Congress. Tonight, the House of Representatives passed an auto industry bailout that Democratic leaders and the White House agreed upon after days of intense negotiations. The measure still faces strong opposition in the Senate. And in a moment, we'll hear from one of the Republican senators vowing to fight the bill. But we begin this hour with Debbie Elliot on the state of play on Capitol Hill. DEBBIE ELLIOT: The idea is to give struggling auto makers $14 billion in short-term emergency loans to keep them afloat through March. They're to use that borrowed time to transform into lean, solvent enterprises under the direction of a car czar, appointed by the president. And while Democratic leaders in the White House reached an accord on what should be included in the bill, it faces an uncertain future in a bailout-weary Congress. House Majority Leader Steny Hoyer acknowledged the uphill battle. Representative STENY HOYER (Democrat, Maryland; House Majority Leader): There is a great deal of reluctance to directly assist the auto companies. On the other hand, the sense I have of our members and indeed, of the country, is that the impact, both psychologically and actually on the economy, would be very, very severe and substantial. ELLIOT: The money will come from funds Congress has already appropriated to help the auto industry retool to make more fuel-efficient vehicles, a Democratic concession to the White House. That money is to be replenished next year. Democrats also gave up a pre-condition that automakers drop lawsuits over state-emission standards in order to get federal funds. White House Deputy Chief of Staff Joel Kaplan said today it was critical that the car czar have the power not only to oversee the loans but to also force the companies and their stakeholders to restructure or face bankruptcy. Mr. JOEL KAPLAN (White House Deputy Chief of Staff): This is going to take a couple months of sitting down, banging heads, getting everybody in a room and saying, what are you putting on the table to make this firm viable, how much skin are you willing to put in the game. And it's either enough or it's not enough, and the president's designee is going to be on the hook for making that determination at the back end. ELLIOT: Kaplan said it's not something you would want to do in, quote, normal times. The White House dispatched Chief of Staff Joshua Bolten to Capitol Hill today to lobby reluctant Republicans. He got a cool reception. After the Senate GOP luncheon, Tennessee Senator Bob Corker said, quote, I think they had less support when they left than when they came in. Alabama Senator Richard Shelby called the bill a travesty. Senator RICHARD SHELBY (Republican, Alabama): Unless Chrysler, Ford and General Motors become lean and innovative and competitive in the marketplace, this is only delaying their funeral. ELLIOT: Shelby and other Republican senators have promised to use that chamber's rules to block consideration of the auto bailout. Debbie Elliot, NPR News, the Capitol. 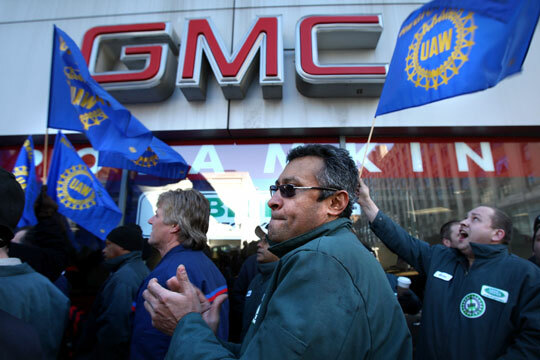 Auto dealership employees, mechanics and members of the United Auto Workers rally Monday in New York City in support of the proposed auto industry bailout. Democratic lawmakers and the Bush administration have finalized a deal to speed $14 billion in emergency loans to U.S. automakers, according to a draft of the deal released Wednesday. The White House would only say that the deal has made "very good progress." It could go to a procedural vote in the House on Wednesday and be enacted by week's end. But congressional Republicans, left out of negotiations, could block the measure. Sen. David Vitter (R-LA) promised to filibuster the measure, which could delay a final vote for days. Senate Republican Leader Mitch McConnell of Kentucky said his side hadn't seen the measure yet and wouldn't agree to votes on the measure Wednesday. "Republicans will not allow taxpayers to subsidize failure," he said. The plan would allow GM and Chrysler to avert threatened bankruptcy through March. Ford, which is in a somewhat more stable financial position, has requested an emergency line of credit for use later if its balance sheet deteriorates. While the Big Three would be thrown a lifeline in the form of low-interest loans, the money would not come without stringent conditions — the government will become the companies' biggest shareholder, and a so-called "car czar" will be appointed to oversee the manufacturers. The czar could withhold additional loans or recommend a bankruptcy restructuring if progress toward a turnaround stalls. Republicans wanted a bankruptcy option as an incentive for labor unions to agree to concessions. They expressed concern over Chrysler, which is owned by private equity firm Cerberus Capital Management. During the talks, Democratic aides said the Bush administration resisted a bid to hold Cerberus liable for repayment if the auto company defaulted on any government loan. One sticking point could be Democrats' insistence that automakers drop lawsuits against California and other states that have passed auto emissions standards in excess of those mandated at the federal level.